This is going to be music to ears of Indian online matrimonial sites – Associated Chamber of Commerce & Industry in India (ASSOCHAM) has researched that Online Matrimony services in India are exploding right now, and by 2017, the market will triple to Rs 1500 crore from Rs 520 crore at present. These revelations came out in its recent report titled “Rising trends and popularity of online jobs and matrimonial alliances” which it released yesterday. 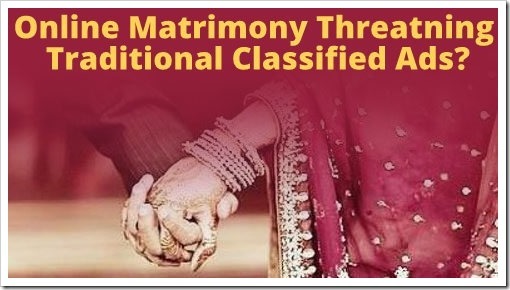 The report states that Online Matrimony threatens to disrupt traditional model of marriage alliances and the system of newspaper classifieds as more than 50 million users have registered themselves in online matrimony portals last year, with 2.5 million new registrations every month. The registration numbers will witness an increase of 65% year on year for the next two to three years, and this will mean lesser newspapers classifieds and fewer takers of traditional matrimony services. As per the report between 2011-12 and 2012-13, online matrimony services records a healthy growth rate of 56% and 52%, which is the second highest growth in any online industry; second only to job portals which registered a staggering growth rate of 75%. ASSOCHAM report suggests that the main reasons for such an exponential growth of online matrimony services are the age and convenience factors. India has the one of the youngest population in the world, and is 4th largest country in terms of Internet usage. The age group of 21-35 years in India is now knowledgeable, empowered and has an open mind. They are not shy of experimenting and researching when it comes to selecting life partner, and are open to inter-caste marriages as well. It has been observed that a single person registers himself in several portals for getting the best match. Additionally, the convenience factor is also very important. Without wasting time or resources, the potential candidate can create their profile online and start interacting, searching immediately. Which Other Online Industries Are Growing? Besides matrimony, the other industries which are growing online are jobs and travel along with ecommerce. In the online job search market, there were 25 million job seekers in the last fiscal 2012-13, which is expected to increase to 50 million by 2016-17. At the same time, these job portals receive an estimated traffic of 65 million during the current fiscal year, which proves that people are relentlessly searching for new opportunities and avenues of growth; and online medium is the best way to achieve that. 50% of all job seekers constitute from the junior level to mid-level and senior level. 43% of all job seekers are in the age group of 26-35 years of age with 72% of them male and 28% females. Maharashtra is the #1 state when it comes to job seekers, followed by Delhi, Tamil Nadu, Karnataka and West Bengal. Online Travel is another sector which is witnessing record growth in India. Compared to 2012, online travel transactions and orders grew by 25%. In the month of June, 2013, total railway tickets ordered online were 6.81 million, compared to 5.83 million in June 2012. Similarly, the number of air tickets booking online increased to 1.7 million in 2013, compared to 1.45 million in 2012. You can access the complete ASSOCHAM report here.